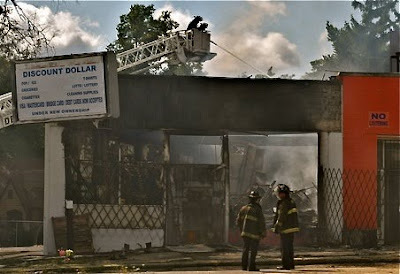 Arson is suspected as the cause of a fire at the Discount Dollar store on Welch Blvd. The store is located near the spot of the old Della Theater and across the parking lot and drive-thru lanes of the old Genesee Bank branch. 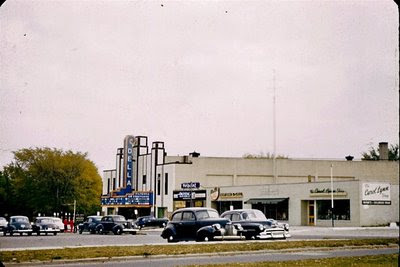 A 1950s photograph of the Della and other Welch Blvd. stores by Mary Fisher. Labels: arson, Della Theater, Discount Dollar, Genesee Bank, Mary Fisher, Oscar Durand, Welch Blvd. so is that the old welch blvd pharmacy location? Nope, it's the opposite side of the street at the other end of the block, more toward Dupont than Chevrolet. It's basically across the street from the old Baskin Robbins. So this is this photo (the burned out one) would have the old gas station to the left of it and baskin robbins on the far right? Because the location you describe close to dupont and the bank across from BR is to my (admitedly fading) brain cells the 70's location of the pharmacy. Unclebuck. I would have only been 7 compared to your 13 years, but your phrase "thopse were magical times" sure hit home. The only contest I've ever won (to this day) was at the Della. You got in free to see Snow White and the 7 Dwarves (already in its 20th year) by naming all 7 Dwarves correctly for the Usher. It saved me all of 15cents but that was big money for a kid way back then in Flint. we're gonna have to agree to disagree. I am pretty sure this is either the location of, or right next door to, the welch blvd pharmacy that sponsored us in little league. Jim, I think we're both right. It's now dawning on me that the pharmacy was originally on the corner near the gas station and then moved across the street near the bank. I now remember it being near the bank when I was in high school. I know the daughter of one of the owners, so I will solve this mystery. Or we will have to have a duel in Hidden Park to defend our honor. My brother, who worked there for a year, supports my theory that by the late 70's early 80's this was the pharamacy location. So it's pistols at Dawn! Uhh, there was a weird little greasy spoon in that plaza, right? Wasn't there an RC's Sports too? Who cares? As long as Mounir's is still selling to minors. Wow...thanks for the post. I now recall that my Grandmother worked at the Buttercup Bakery on Welch Boulevard (this is the early to mid 60's). When stayed with her for visits, I'd walk there (she lived on Mallory) and I'd get a donut at a notably deep discount. 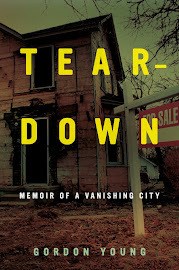 I grew up in the Mott Park neighborhood, but my Mom grew up on Chippewa north of Hamilton. My parents belonged to Community Presbyterian at Chevrolet and Dayton, I went to Longfellow Elementary and Junior High, and a couple that were good friends of my parents lived just west of Chevrolet and Welch, so my Mom favored that little shopping complex through my growing up years. There were storefronts on Stockdale as well. One of them was a shoe store. In ninth grade, I had a pair of orange chukka boots from there. Dunno why I remember that. I recall that there use to be a restaurant/coney island in the location where that dollar store once stood in the late 70s/early 80s. I think that I may have even eaten there...but my brain is a little foggy as to why I would have been there or have even eaten there -- remember it was the late 70s/early 80s. I had lunch with my parents today, and was reminded that the row of stores on Stockdale included, in addition to the StrideRite shoe store, a Bo-Kay ice cream cone emporium and the west-side sales-only location of Balkan Bakery, back when the actual bakery was over in the east-side Eastern European neighborhood. Mid to late 50s for me. There also was an ice cream place on Third Avenue, north side, just east of Grand Traverse near the Hamady store. In my vague memory, it might have been a Bo-Kay, but my mom said something about it being Paterson's. They, too, offered a rainbow of colors. I do recall that their counter was at about my chin height at the time. They had a game for little kids, with a multi-colored bunch of plastic sticks. They'd dump them on the counter in a jumbled pile. If a little kid could remove some number of sticks one at a time from the pile without making any other sticks move, they got an extra scoop for free. Hey Holbel and willy, I lived on Mallory in the 50s and got my haircuts at Don's Barbershop in that strip of stores on Stockdale by Welch and Chev. It was something like .25 for a butch and .50 for a standup. He had to have the best comic book stash on the west side. The dollar store was next to the old pharmacy location, well where it was located last anyways. There were a few restaurants there, a coney spot yes, and in the 90's "Anita's". Does anyone remember the Slush puppie machine that used to be in the pharmacy? Believe it or not it is in my garage--- i worked as a tech. before the pharmacy closed and the owner let me have it. Hello do anyone remember A Baskin Robbin being on Clio Rd.